When Saxony’s rulers really wanted to let down their hair, they headed just outside Dresden to castles and country houses along the River Elbe. There they hunted in the open air, cultivated fine wines, and oversaw porcelain-making and other pursuits. Visitors to the Saxon Elblands can still enjoy those rulers’ fun-loving legacy. In Radebeul, taste red, white and sparkling wines at Schloss Wackerbarth, where one of August the Strong’s favorite courtiers built a lavish baroque estate. In Meissen, explore Germany’s oldest castle, Schloss Albrechtsburg, where European porcelain—known as “white gold”— was first created and tour the famed MEISSEN Manufactory. 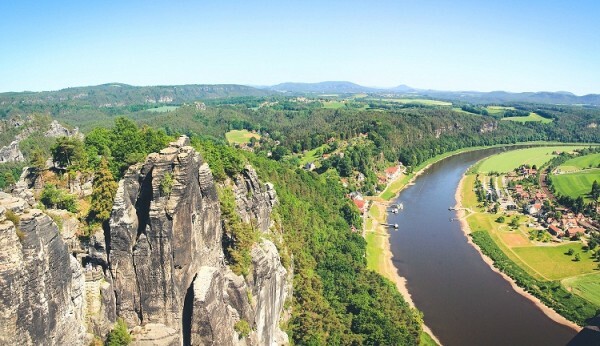 In Saxon Switzerland national park, gaze at fantastically sculpted sandstone peaks from the rock-bound Bastei Bridge, hike through lush gorges and savor a long, leisurely lunch in the Panorama Restaurant high above the River Elbe. Getting to the Saxon Elblands from Dresden is easy, whether you travel by train or bus, bike or paddle-steamer. Surrounded by vineyards and hiking trails, Meissen is only a half-hour train or bus ride from Dresden. Founded in the 10th century, the “Cradle of Saxony” is popular for its hilltop castle and 13th-century Frauenkirche, plus newer attractions like the Animal Park and Wellenspiel wellness center. But the town is renowned for the MEISSEN Manufactory, birthplace of European porcelain. Even the Frauenkirche’s church bells are made of Meissen porcelain, not to mention the statues in nearby St. Nicholas. How porcelain came to be made in Meissen is a uniquely Saxon story. August the Strong, Saxony’s art-loving ruler, was absolutely besotted with Chinese porcelain. Determined to make the very first European porcelain, August imprisoned alchemist Johann Friedrich Böttger in Meissen’s Schloss Albrechtsburg. In 1708, Böttger created high-quality porcelain using kaolin from Dresden mines. Two years later, the Meissen porcelain works opened in the castle. Today, the MEISSEN Manufactory overlooks the Triebisch River, a stone’s throw from Albrechtsburg Castle. In the contemporary-style visitor center, buy a ticket for a guided tour or self-guided audio tour. Better yet, purchase a reasonably priced combination ticket for the MEISSEN Manufactory and Albrechtsburg Castle. 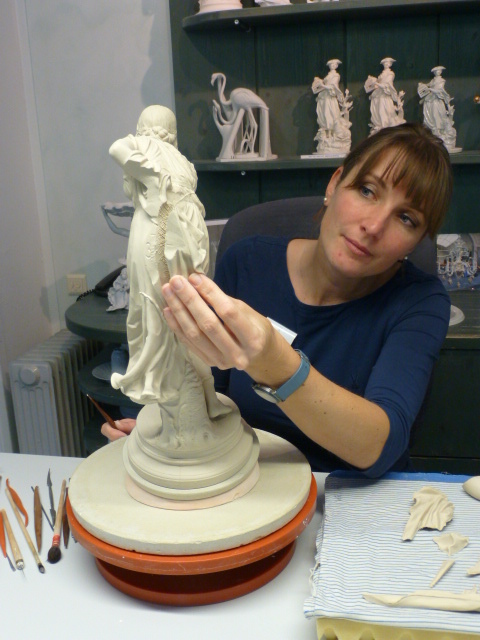 Tours start in the Demonstration Workshops, where Meissen’s highly trained artisans painstakingly make, glaze and paint porcelain tableware and figurines. In the Museum of MEISSEN Art, 2,000 porcelain works range from a tiny thimble to an elaborate centerpiece for King August III, August the Strong’s heir. You’ll see Italian Commedia dell’Arte figurines like Harlequin, Colombina and Dottore, monkey-orchestra figurines popular in early France and gold-encrusted porcelain that Russian nobles favored. Ceremonial tableware for Jewish high holidays is also displayed. Centuries ago, Meissen commissioned artists to create its now-legendary patterns. At the recently established MEISSEN artCAMPUS, artists-in-residence have included Massachusetts-born artist Frank Stella, who produced a huge white porcelain sculpture, and New Yorker Chris Antemann, who created Baroque-style figurines socializing—in various stages of undress—at lavish dinner parties. The Boutique and the Outlet sell porcelain in traditional designs, like the pink MEISSEN Roses and blue-and-white Onion pattern, as well as contemporary designs. 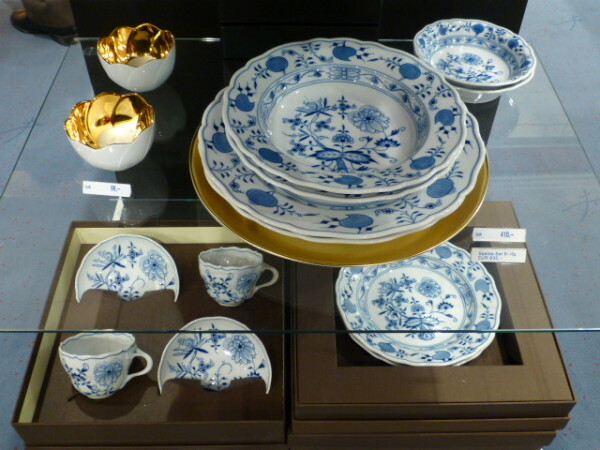 The Joaillerie stocks jewelry, housewares, and MEISSEN Couture, including silk ties and scarves, in popular porcelain patterns, and the Museum Shop sells souvenirs. Before heading to Schloss Albrechtsburg—with its historic porcelain displays—stop at Restaurant Meissen for coffee and pastries, or a complete Saxon meal, perhaps Weiner schnitzel with red cabbage, and a glass of Pilsner beer, or local wine like Goldriesling from Meissen’s Schloss Proschwitz or sparkling wine from Radebeul’s Schloss Wackerbarth. Fittingly, your next stop is Schloss Wackerbarth, Germany’s second-oldest sparkling-wine facility, and a top producer of red and white wines. From Meissen, a 10-minute train ride takes you south to the Radebeul Ost station, a short walk from the winery. Step through the contemporary entranceway of Schloss Wackerbarth’s modern visitor center, and enter a world of baroque splendor. 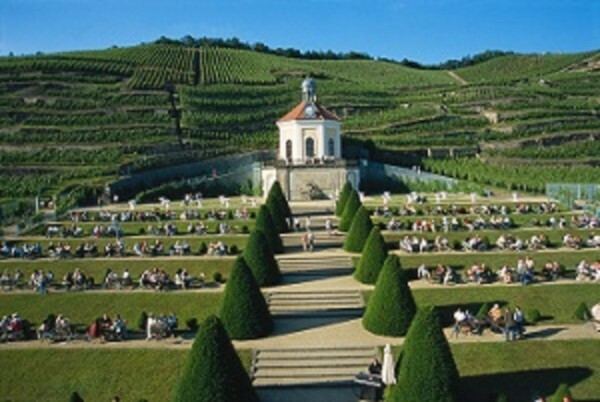 Amid terraced hillsides, planted with Saxon grape varieties like Goldriesling, Müller-Thurgau and Traminer, rises a yellow-and-white belvedere with a red-tiled roof. Below, the estate’s baroque manor nestles amid lush gardens. In the early 1720s, one of August the Strong’s courtiers, Count von Wackerbarth—the same Dresden governor who commissioned that city’s landmark Frauenkirche—built a country getaway here. From the 1800s till the mid-1940s, Schloss Wackerbarth and its vineyards changed hands many times. In 1948, the Communist East Germans took control, establishing a sparkling-wine facility in the late 1960s. Since German Reunification in 1990, Schloss Wackerbarth has been extensively renovated and has added a gleaming new production plant. 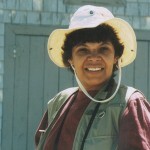 Five tours, with tastings, are given, from the basic Wine Tour to the Vineyard Hike through terraced vineyards. Special events include the Saxony Tasting, with wines from Schloss Wackerbarth and nearby estates paired with local dishes. On Sundays and bank holidays, the restaurant hosts a Vintner’s Brunch with sparkling wines and a Saxon-style buffet. Summer festivities include the Summer Night Ball and the Park Wine Festival. The fall harvest brings the Federweisser Festival. Christmas celebrations start with the Long Night of Wine, focusing on rich red wines, and end with a New Year’s Eve gala. As your Schloss Wackerbarth tour guide will proudly explain, The Saxon Wine Trail—which can be followed by bike, train, paddle-steamer or car—stretches 34 miles along the River Elbe from Pirna, south of Dresden, to Diesbar-Suesslitz, northwest of Meissen. Though wine has been made for 850 years in Saxony, it’s Germany’s smallest wine region, with only 1,109 acres in production. Saxony’s winelands are also Europe’s most northeasterly. But the challenge of growing grapes at 51 degrees latitude is mitigated by the Elbe Valley’s warmth, by using angled terraces with stone walls to trap and retain the sun’s heat, and by planting hardy local grape varieties like Elbling, Goldriesling and Müller-Thurgau. Strolling through cool underground production facilities, with gleaming steel tanks for fermenting white wines and oak barrels for aging red wines, you’ll learn about virtually every aspect of Saxon wine-making. 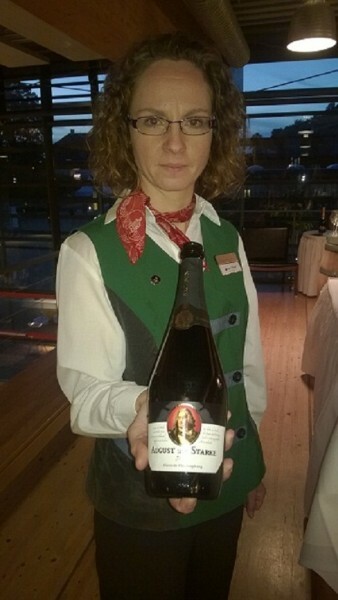 The tour ends with a tasting of several wines, perhaps August der Starke sparkling wine, redolent of peaches and made using the classic French méthode Champenoise; a crisp Goldriesling that’s a uniquely Saxon cross between Riesling and Madeleine Royale grapes, and a dry, late-harvest Riesling-Radebeuler Steinrücken Spätlese. Book ahead, and savor more wines over Saxon-Mediterranean cuisine in Schloss Wackerbarth’s elegant award-winning restaurant. Or simply purchase Schloss Wackerbarth vintages in the winery shop or online, and share the Saxon good life with friends and family. Schloss Wackerbarth epitomizes the beauty of Saxony’s cultivated countryside. An hour south of Dresden, there’s even more spectacular scenery in Saxon Switzerland, a 36-square-mile national park straddling the German-Czech border. With phantasmagorically shaped sandstone mountains, Saxon Switzerland is popular with mountain and rock climbers, who have their pick of 14,000 routes over 1,100 free-standing peaks. More laid-back nature lovers can take in the mountain-and-woodland scenery while standing on outlooks like the famous Bastei Bridge, hiking more than 700 miles of trails or lunching on Saxon specialties in the Berghotel Bastei’s contemporary-style Panorama Restaurant. From Dresden, Saxon Switzerland national park is easily reached on public transportation. Take the S-Bahn S1 commuter train 20 minutes, in the Bad Schandau direction, to Pirna, whose Market Square was immortalized by 18th-century Italian painter Canaletto. From the Pirna train station, walk a couple blocks to the bus station, and pick up Bus 237, in the Hocksteinschänke direction, for the 25-minute ride to Bastei. From the bus stop, the Bastei Bridge complex is a short horse-drawn wagon ride or a 10-minute walk. Famous since 1824, when the first wooden span opened, the Bastei Bridge, now stone, is surrounded by several contemporary-style buildings. At the four-star Berghotel Bastei, with 64 rooms, a restaurant, a spa and a bowling alley, you can overnight for as little as $125. A few steps away, at the hotel’s Panorama Restaurant, with picture windows perched above the River Elbe, enjoy a long, relaxing lunch of German specialties like roast pork fillet or fried perch with locally made wines. Outside the restaurant, short trails lead to the Bastei Bridge and other outlooks. Made famous by German Romantic painter Caspar David Friedrich and Expressionist Ernst Ludwig Richter, the 250-foot-long Bastei Bridge sits atop a row of toothy rocks. With seven arches spanning a 130-foot-deep ravine, the bridge provides fabulous vantage points over the Elbsandstone Mountains on one side and the River Elbe on the other. Just beyond, mountains and rocks form a protective bastion, or bastei, around the ruins of 12th-century Neurathen Castle. To experience Saxon Switzerland up-close, bring along your hiking boots, a small backpack and a water bottle. 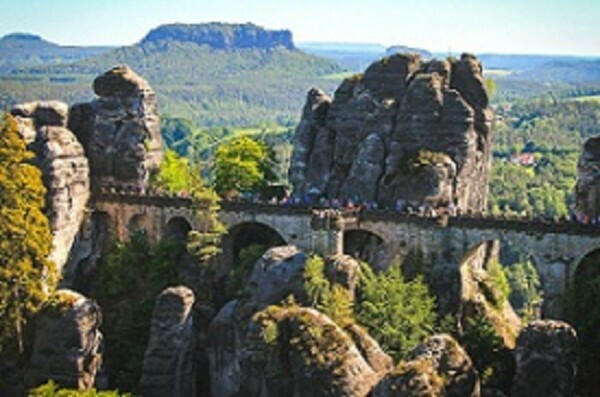 Although the 70-mile Malerweg, or Painter’s Path, takes several days, there are many short trails near the Bastei Bridge. One of the most popular is the 1 ½-2-hour hike along the Schwedenlöcher, offering some of Europe’s most stunning mountain and forest views. 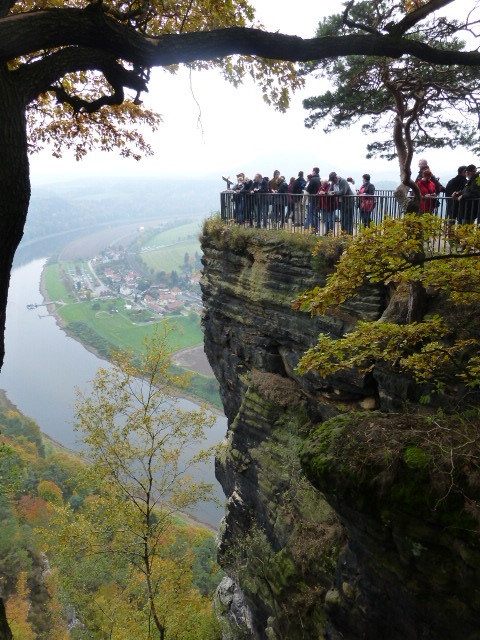 From the Berghotel Bastei, the route to the trail is an easy 20-minute stroll along a flat, tree-shaded path. Once you reach the Schwedenlöcher’s actual trailhead, the route seems to drop straight down into a narrow, rock-bound gully. At first glance, the trail looks treacherous, but steps, handrails and small metal bridges make it navigable. Still, given all the Schwedenlöcher’s twists and turns—not to mention the huge boulders, sharp rocks and fallen trees—it pays to stay focused. In the hike’s last 30-40 minutes, the Schwedenlöcher flattens out, taking you past the peaceful green Amselsee, a favorite lake of boaters and anglers, and the rustic, waterside trout smokehouse and eatery, Frische Forellen. Soon you’re in the center of Rathen, a little spa town with 14 hotels including two deluxe waterfront establishments: five-star Elbiente and four-star Elbschlösschen. At the river’s edge, give the boatman a euro for the five-minute Elbe crossing aboard an old-fashioned cable ferry. Then walk 10 minutes to Rathen train station for the 22-mile ride back to Dresden. From there, you can hop a high-speed Intercity-Express (ICE) train for the 2 ½-hour journey west to the state of Thuringia and the storied city of Weimar. For flights, contact German national carriers airberlin (www.airberlin.com) and Lufthansa (www.lufthansa.com). For German rail information, visit www.bahn.com. For train/bus/ferry/biking information, contact www.vvo-online.de/en. For Saxon Elblands information, log on to www.visitsaxony.com, www.elbland.de and www.schloesserland-sachsen.de. For specific towns, visit www.touristinfo-meissen.de, www.radebeul.de and www.pirna.de. For general information, visit www.germany.travel.